Well, the big storm that has been crossing the country finally made its way to Massachusetts yesterday afternoon. 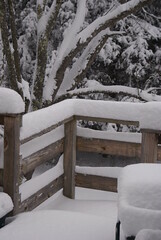 We definitely have about a foot of snow – and it is still snowing. I think we were very lucky though. The storm hit us on a Friday afternoon – and everyone knew it was coming. In fact, a couple of people commented that it felt like the end of the world was coming. Many people didn’t come to work; and many businesses had simply closed for the day. The college where I work closed at noon, even though it didn’t start snowing until about 2PM. I am definitely glad that I was home before it started. It was wonderful to be home, warmly ensconced in my comfortable clothes, curled up on my couch with a book. There hasn’t been any real need to go out – and I’m getting a good handle on trying to get my house clean before I have family over next weekend. One caveat, my husband’s work Christmas party is tonight, at least an hour away (in good driving conditions). I’m not too keen on having to get dressed up and venture out, but we do what we must. The best part about snow before the holidays is that it definitely helps to put me in the Christmas spirit. All of the holiday decorations look amazing in the snow. The down side, however, is that I haven’t finished my Christmas shopping or errands. Time is growing short, and I won’t be able to do those things that I had planned to do this weekend. I guess I will just have to stop worrying about it – and enjoy the day! During the summer of 2007, I consciously decided to limit my outside distractions and focus on finishing school. I was emotionally overwhelmed by school issues and felt like everything in my life revolved around libraries. I worked in one all day and then spent an inordinant amount of time studying about them while I was at home. I decided that finishing school was critical – and knew that I had no intention of quitting my job (which I love on most days). I did, however, cut down on blogging-related activities – both writing and reading. 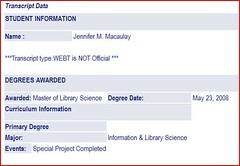 This meant that I starting isolating myself from the greater library community. Oddly enough, it did help me get through my last two semesters of school. However, I have now been out of school for six months and I have not yet re-engaged myself. I am now making a conscious effort – giving myself a swift kick in the posterior – to get out of my funk. I have become involved in two new projects at work (creating accessible library workstations for physically challenged students and taking responsibility for a relatively new digital image application – projects that I care about deeply) and am hoping to start blogging with more regularity. I have found that when I am in a blogging groove I pay greater attention to library news and read more attentively. I think about issues more and thus, am more engaged. By the way, the picture has no relevance to the post. I took this picture this morning and it made me happy. 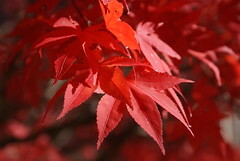 The bright red of the leaves of this Japanese Maple tree in my front yard is such a beautiful color! My husband and I bought a new camera on the day that we flew to Seattle. As such, we were definitely a bit picture happy. In all, we (between the two of us) took 1242 pictures over a 7 day span. Wow!! I’m having a very nasty time trying to go through the all to choose the ones that I want printed out. It might take me a month to actually go through them all. 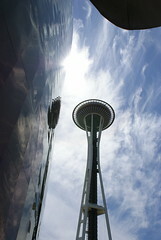 But, I will say that this picture of the Space Needle that my husband took is my favorite picture. Very cool! Today is my first day back to work after having been to web development training in Seattle last week. I’m beyond sluggish this morning as my body tries to adjust to the time difference. I’m hoping that it doesn’t take too long for everything to get back to normal! Seattle was absolutely gorgeous. I thoroughly enjoyed my visit. 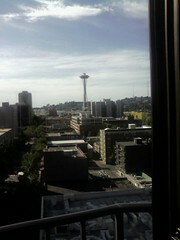 I was terribly impressed by the view of the Space Needle from the hotel room (the Warwick Hotel). The training was excellent. My head is spinning because I learned that I have way more work to do than I thought in order to get our library web site into the new content management system that the college purchased. Mount Rainier was my favorite sight. I definitely have a thing for natural phenonema, especially mountains (we only have piddly little hills in the southeastern Massachusetts area). My husband and I took over 1200 pictures on our trip and a good percentage are of Mount Rainier. We were lucky to have had beautiful (and very sunny) weather in Seattle. This meant that Mount Rainier was always visible. Vancouver, British Columbia was also a beautiful city. However, everything was incredibly expensive. The exchange rate was about 80 American cents to the Canadian dollar (a friend from Vancouver also explained that most retailers lag behind in keeping up with changes in the rate. The actual rate should have been about 93 American cents to the Canadian dollar. That is a HUGE difference. Fortunately, it dawned on my at this point that paying by credit card would be the best move). I was absolutely horrified by the fact that the family sitting in front of me on the flight to Seattle had a kitten with them. Jet Blue allows pets on board, so the family wasn’t breaking any rules. However, the kitten was in a duffel bag stored under a seat. It meowed for a good portion of the flight. The father would open the bag a bit to try and get the kitten to stop making noise. I will admit to not being an animal person – and that I would prefer not to have had a pet on board even in a proper storage container (although I have no clue what type of container that would be). However, I thought it rather cruel that someone kept a kitten in a duffel bag on a six hour flight. Seriously, this made me incredibly uncomfortable. I had to turn the volume up on the tv hookup in order to try and drown out the noise. Earlier this week, I received a letter in the mail from the ILS department of SCSU. I was a bit speechless when I opened the letter to see this certificate inside the envelope. 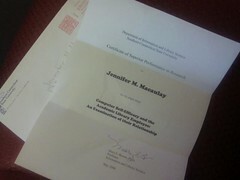 The paper reads “Certificate of Superior Performance in Research,” then my name, and the title of my computer self-efficacy research paper. It is signed by my professor. I have no idea of its value, having never heard of such a certificate. However, I’m willing to take it at face value. I will say that my husband was unimpressed. Wow! What a nice way to end this class – and the program. The fact that this last semester was such a great experience is doing wonders for how I will remember my time at SCSU (I guess I’m easy to please). Last week, I enjoyed two excellent adventures. The first was an unexpected trip to see a baseball game at Fenway Park. 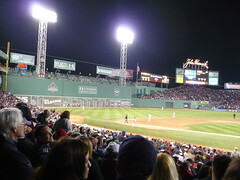 On Tuesday, May 20, my husband and I went to see the Red Sox win a game against the Kansas City Royals. We had excellent seats. We got to see a new pitcher up from the minor league. And, we enjoyed singing both Take Me Out to the Ball Game and Neil Diamond’s Sweet Caroline. There was relatively little traffic on our way into or out of Boston. All in all, it was a wonderful evening. This was my fourth trip to a game at Fenway. I always forget how much fun it is to go. Then, I took Friday off to go see Indiana Jones and the Kingdom of Crystal Skulls with hubby Mike. I thought it was wonderful – much better than I expected it to be. I loved the X-Files-ish storyline. It made the storyline much more intriguing to my husband (the conspiracy theorist who adores anything and everything related to Roswell). Kudos to Steven Spielberg and George Lucas (oh, and definitely to Harrison Ford).